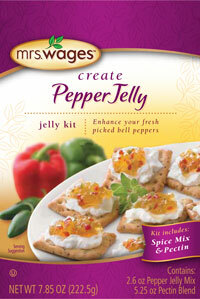 Mrs. Wages Pepper Jelly Kit is a complete mix kit for making that special pepper jelly. Our Pepper Jelly Kit in a box, complete with pectin and spices to make the best pepper jelly! Contains 2.6 oz. of pepper jelly mix and 5.2 oz. pectin blend. PEPPER JELLY MIX: RED BELL & JALAPEÑO PEPPERS, SUGAR, GARLIC, CITRIC ACID.